The different units of Pangasinan State University (PSU) have been working diligently at sustaining and assuring the public of their quality service, according to a recent update during the three-day Annual Accomplishment Report presentations which started on January 30 to February 1. For the year 2018, there had been a great move towards benefiting both the employees and the students, Dr. Melody De Vera, PSU Planning Director, stated in an interview. Every unit’s contribution is essential for it is towards the realization of the University’s vision, De Vera added. More so, the following are the reported breakthroughs in Research, Extension, and Instruction: The Curriculum Instruction and Accreditation made certain that all programs were accredited up to Level IV in its eventual goal to attain Center of Excellence; ISO certification, the Philippine Quality Award was worked upon by the Quality Assurance (QA) of the University; Publication of researches internationally and locally by PSU Professors and Instructors; For the University’s Extension, PSU did reach out to those out-of-school youth and unemployed by conducting trainings and seminars to barangays engaging them in livelihood activities like Bangus deboning and Mushroom and Culture and Production. Each day of the meeting participated by University Directors was a discussion of accomplishments among ten units. On the first day, Registrar, Cultural Affairs, Admission-Guidance and Counseling, Research-Patenting-Publication, Income Generating Projects, Disaster and Risk, Procurement, OJT, BAC and Auxiliary Services reported. While Human Resource, Quality Assurance, Physical Plant and Facilities, Medical and Dental Services, Student Service, Statistics Center, Property and Supply, International Linkages, PRPIO, and CEL for the second day. On February 1, University Directors’ Meeting was concluded with GAD, Engineering, Extension and Community Services, Security and Maintenance, Legal Services, MIS, Sentro ng Wikang Filipino, Sports, CIA, and Special Projects as the last units to report their accomplishments. The conduct of Annual Accomplishment Report is important to reflect on what the University as a whole has done, Dr. De Vera emphasized as she also unraveled that collaboration is the key to the University’s success. Regional Gender and Development Committee-1 (RGADC-1) which was composed by representatives from twenty nine government agencies visited Pangasinan State University Urduja GAD Resource Center (PSU-UGRC) on February 21-22 to monitor the efficiency and effectiveness of the said office. 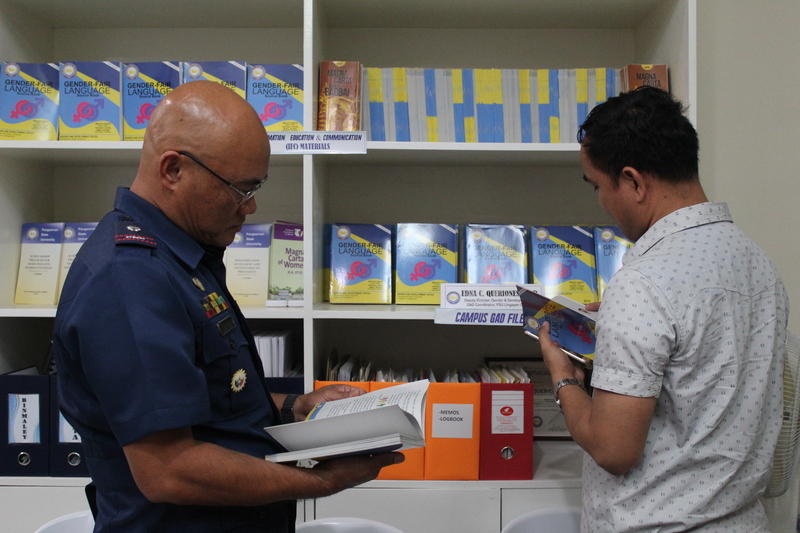 During the first day of visit, RGADC-1 members inspected documents inside the Resource Center which earned PSU an approval regarding the existence of gender-related materials in the resource center which could be of help to its beneficiaries as far as information dissemination is concerned. When asked about the nature of this visit by RGADC-1, Dr. Merlita Q. Santos, Director for GAD explained that it is on a take-turn basis which then was the turn of PSU-UGRC to be checked of its activities, documents, and plans for the present year. Said organization took the whole first day of visit in reviewing documents followed by a courtesy call to PSU President, Dr. Dexter R. Buted. During the courtesy call, Dr. Buted poured out his gratitude to RGADC-1 along his plight about the partnership. The University President is auspicious, the partnership would not be limited to conduct of seminars, symposiums, conferences, and the likes but rather be innovated and metamorphose its focus to research and activities that would cater people practical solutions to problems concerning gender and development. On the second day, February 22, PSU-UGRC officials and RGADC-1 gathered at PSU Convention Hall for a meeting aimed at approving highlights and discussing matters from the previous meeting; discussing CY 2018 RGADC-1 Accomplishments; approving CY 2019 RGADC-1 Workplan; discussing GAD budget For a; discussing establishment of a Zonal GAD Resource Center; and approving activities for CY 2019 Women’s Month Celebration. Said meeting proceeded to its agenda regulated by Atty. 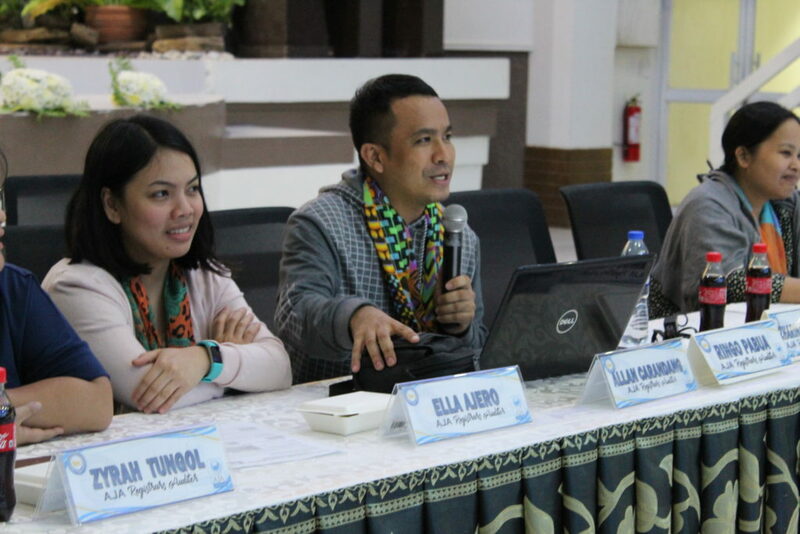 Harold D. Kub-aron, RGADC-1 Chairperson and a forum was also conducted during the meeting among representatives of the involved agencies in discussion of gender-related matters. At present, PSU-UGRC, headed by Dr. Merlita Q. Santos, is bound to strengthen capacity of the University to send more GFPS members in international/ national GAD-related events, programs, and activities set as its ultimate objective responding to gender issues, its causes, and GAD mandates. The membership of the University’s GAD Resource Center was just recently approved by RGADC-1 on May 15, 2018 having recognized PSU-UGRC’s critical role in assisting the said organization on capacity building and in championing the cause of GAD in higher education and in research and extension. Anent the offer of membership by RGADC-1, PSU-UGRC responded and accepted it on May 30, 2018 in a hope it can contribute to the enhancement and promotion of gender and development in the region. Hence, the partnership with mutual goals led to this two-day visit. About 70 Pangasinan State University (PSU) Federated Student Government (FSG) and Supreme Student Council (SSC) officers, along with university and campus officials, participated in the 2019 Peace Congress during the Peace Festival and Grand Launching of Volunteer Individuals for Peace (VIP) held at the Philippines Sports Stadium in Bulacan to support the national call for peace. Heavenly Creature, World Peace Restoration of Life (HWPL) and the Commission on Higher Education partnered to mobilize the students from the different State Universities and Colleges in the country, especially those who were from Central Luzon, to take a part on achieving sustainable peace and development. “Promoting peace education through the CHED will affect many Philippine educational institutions and play a crucial role in promoting peace in the Philippines,” said Ronald Adamat, CHED Commissioner. 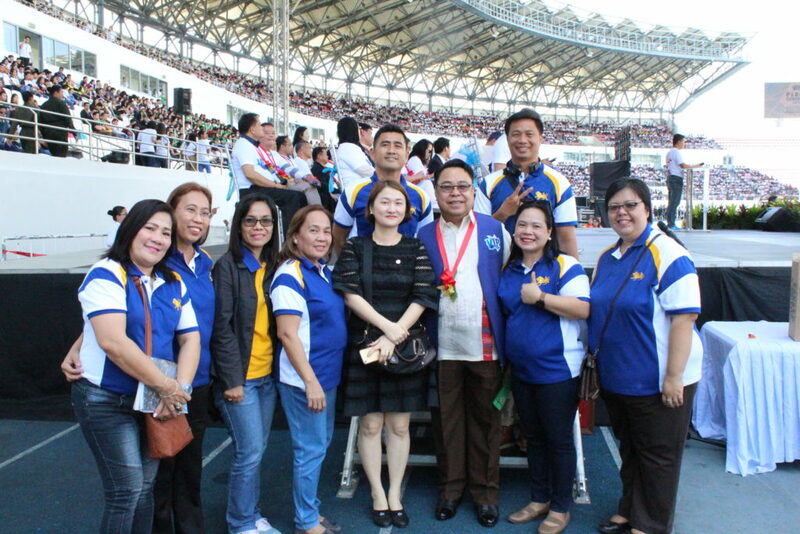 Around 30, 000 government officials, religious leaders, journalists, students and faculty from SUCs, women and youth organizations were present in the said event to advocate the cessation of war and achievement of peace worldwide. On the other hand, University and Campus officials had the chance to meet with the CHED Commissioner to personally thank Dr. Adamat for being PSU Board of Regents’ Governing Chairman. Pangasinan State University (PSU) surmounted the second ISO Surveillance Audit and was consequently recommended to retain its ISO 9001:2015 Certification by the AJA Registrars, Inc. led by Mr. Allan Carandang, Audit Team Leader on February 12. Ten auditors from the AJA Registrars, Inc. were assigned to the nine campuses of PSU for a one-day audit and placed into scrutiny the top management as defined in the Management System Organization. Said audit took nine hours of review of all areas concerned before the auditors, and University Officials, Internal Quality Auditors and process owners of the University proceeded at the PSU Convention Hall for the announcement. A deliberation was done before the announcement from which the results were discussed by Carandang leaving PSU with multiple observations, only three minor non-compliance, and zero major non conformities. “Everything boils down to our professionalism, responsibility and accountability as the leaders of this institution. Minor negligence on our part could have been avoided if all truly put their hearts and souls to the challenges during the preparation,” Dr. Manuel expressed as he addresses the observations of the auditing team. Hence, Carandang made the announcement that PSU has successfully remained excellent at its service delivery and outstanding in general for all its areas of concern gaining the approval of the AJA Registrars Inc. to recommend it for the second time for its ISO certification. Behind the success of the said audit were massive preparations hurdled by the entire PSU team headed by Dr. Dexter R. Buted, Dr. Manolito Manuel, PSU Quality Management Representative (QMR), and Mr. Elbert M. Galas, Director for Quality Assurance. As part of the preparation, a conduct of three consecutive meetings including the final ISO briefing in a month among Vice Presidents, Campus Executive Directors, ISO Coordinators and Internal Auditors were held at the PSU Board Room and Accreditation room respectively where strict attendance of the participants was highly monitored. The first call was for a Management Review meeting on February 4 followed by an Internal Quality Auditors meeting on February 6 and a final briefing for the surveillance visit on February 12. The entire community of Pangasinan State University (PSU), led by Dr. Sally A. Jarin, Director for Local and International Linkages wholeheartedly welcomed the Indonesian Exchange Students who will be staying in the five different PSU campuses [Urdaneta City, Lingayen, Sta Maria, San Carlos City, Lingayen, and Binmaley Campus] for a 28-activity-filled days last January 31 at the PSU Convention Hall, Lingayen Campus. During the Welcome Program and Orientation for the 3rd batch of the exchange students on 2019, Dr. Manolito C. Manuel, Vice President for Academic Affairs, said in his speech that it is through the exchange students that PSU is able to put in place its vision to become an ASEAN Premier State University and so he considers them PSU’s blessings. On the other hand, at the end of the Welcome program, Dr. Renato E. Salcedo, SHS principal, oriented them about the similarities and differences of the two ASEAN countries (Philippines and Indonesia) to prevent misunderstandings and to foster unity amidst diversity. Accordingly, the twenty four Indonesian exchange students were grouped as to where they will be having their internship in the five mentioned PSU campuses with the guidance of the assigned internship coordinators: Ms. Marmie R. Poquiz for San Carlos City; Mr. Aurelie A. Peralta for Urdaneta City; Dr. Glynda F. Pariñas for Sta. Maria; Dr. Rosie S. Abalos for Binmaley; and Dr. Regina F. Santos for Lingayen Campus. Meanwhile, the students were deployed in PSU partner agencies: Bureau of Fisheries Aquatic and Resources in Dagupan, Purina Cargill, Department of Public Works and Highways and Pangasinan Electric Cooperative in Urdaneta, Sunflower Garden in Sta. Maria, Food Innovation Center in Bayambang, Tourism Office and Management Information Services Office in Lingayen, and Landbank of the Philippines in San Carlos. 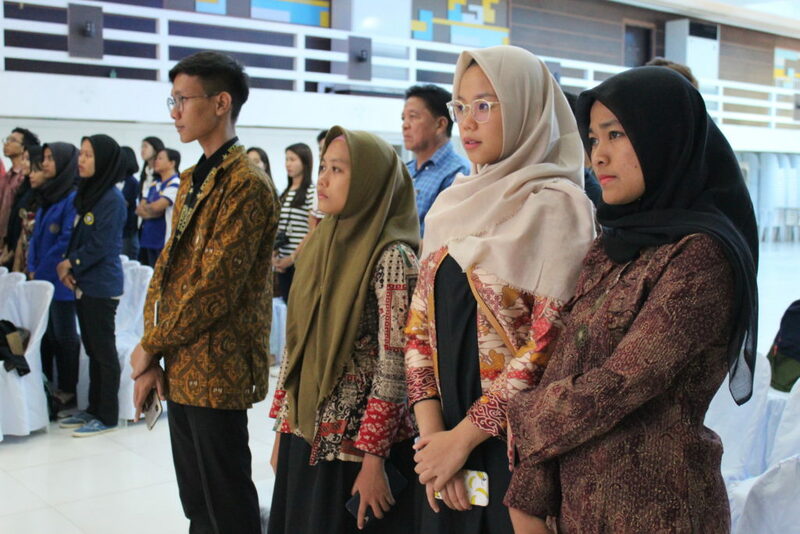 Fulfilled for the success of the program for the 3rd batch of SEA-TVET, Dr. Jarin, welcomed back all the Indonesian students in the PSU Convention Hall for the closing program on February 22. A representative from State Polytechnic of Padang, Edriwan, and a Business Administration graduating student agreed to share his thoughts through a short interview during the closing program. “I was really trained to communicate well to customers especially to the Senior Citizens using of course the English language”, Edriwan gratefully narrated. Likewise, Edriwan said he is open to coming back in the Philippines after his graduation because he was greatly convinced on the superiority of the Filipino culture in the entire ASEAN community. Afterwards, awarding of certificates to SEA-TVET Students and awarding of PSU Symbol were conducted by PSU President, Vice Presidents, Campus Executive Directors and Partner Agencies. The program was concluded with a closing remarks delivered by Dr. Jarin containing the resounding congratulatory message to all of the Indonesian SEA-TVET International students. University of Muhammadyah Purwokerto-Mr. Fakhri Brillians Arpa Putra; Mr. Fajar Muhammad Fauz; Ms. Chichi Dwi Rismawati; Ms. Desi Amelia Ahmad Yani Hermansyah; Ms. Muflihatun Hanifah Abdul Rauf; Toraja Christian University of Indonesia- Ms. Ningoy; Mr. Reksian Bunga Sarrang; Mr. Yermia Sampe Toding; Mr. Arfin Mani Poting; Mr. Eko Patrio; Sebelas Maret University- Ms. Anisa Larasati; Mr. Nur Arif Suko Juliyanto; Bogor Agriculture University- Ms. Weni Pratiwi; Ms. Dwi Mifta Khairumnita; State Polytechnic Banduung- Ms. Sarah Siti Jubaedah; Ms. Miftah Ulfania Fajrin; Mr. Edriwan; State Polytechnic of Padang- Mr. Rafly Refizar Aziz; Mr. Mitaahul Arzaaq Arfi Effendy; Ms. Zilvia Ikhwani; State Polytechnic of Sriwijaya- Ms. Nur Aina; Ms. Leila Utarina; Ganesha University of Education- Mr. Bramudya Ananayta Dutu; Mr. Krisna Bayu Komang.